﻿ Real Madrid 1-1 (5-3 apk) Atletico. The Kings of Europe are back! 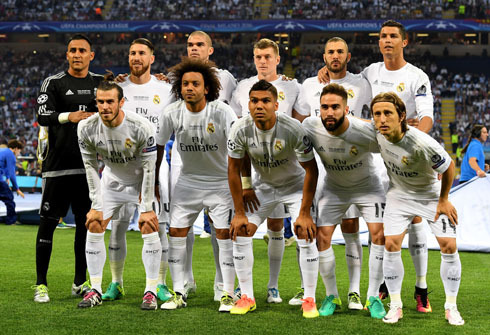 28.05.2016 » Real Madrid 1-1 (5-3 apk) Atletico. The Kings of Europe are back! Real Madrid have finished their season in the best way possible, beating Atletico Madrid in the Champions League final in a dramatic penalty shootout to lift their 11th European Cup in history. Cristiano Ronaldo was uninspired during most of the night, but didn't tremble in the moment of truth when he scored the winning penalty. Astonishing. The eleventh is home. 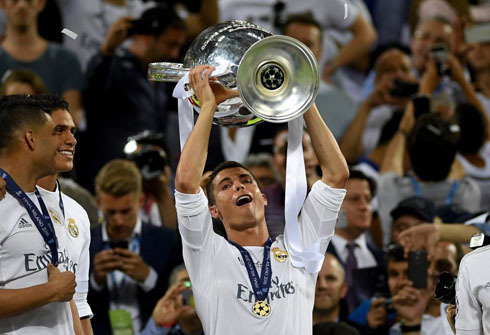 Real Madrid have managed to secure their record 11th European Cup title after a hard-fought battle with city rivals Atletico Madrid. After a 1-1 draw at the of regular time following goals from Sergio Ramos and Carrasco, it came down to the dreaded penalty shootout, where Madrid were flawless. And after Juanfran missed his shot ahead of the last round of penalties, ii came down to none other than Cristiano Ronaldo. And he delivered, easily dispatching his shot into the top right corner. The season is over and Real Madrid are, once again, the kings of Europe! 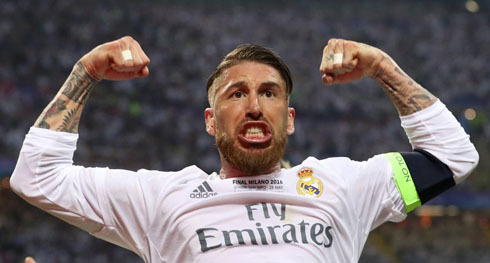 Earlier in the game, it was Sergio Ramos who gave Madrid the lead. His slight touch from a Bale header was enough to beat Jan Oblak early in the first half, and Madrid seemed well on their way. And the performance was excellent as well. The Merengues moved the ball quickly and efficiently and when they didn't have it, they made sure that Atletico did nothing meaningful. As the second half approached Real Madrid were clearly in control. However, Atletico aren't a team to take lightly and they started the second half brightly attacking Madrid again and again. Eventually, the pressure got to Madrid and a Pepe tackle in the box led to a penalty for Antoine Grizemann. Quite shockingly, the Frenchman clattered his shot off the cross bar and Madrid survived. And it would be Carrasco who brought Atletico back into the game late. A close range finish from a Juanfran cross was enough late in the game and suddenly Madrid looked in grave danger of falling to their seemingly fresher and fitter city rivals. Time ticked by and eventually we were in extra time. And that's when fitness issues started to become a real hinderance. Filipe Luis and Koke for Atletico, Bale and Cristiano Ronaldo for Madrid. It seemed everyone had a cramp or muscle injury at any time. It also became clear that both sides were ready for penalties. And they were. A series of makes from both sides left both keepers bewildered as the pressure kept mounting. Soon it was 4-3 and Juanfran stepped up. The veteran right back could only manage to hit he post and soon the stage was set for Cristiano Ronaldo to net the match winner. Who else really? And that he did, his penalty hit the back of the net as Oblak guessed wrong. And there it was... After a season seemingly filled with so much turmoil, Madrid have ended up as European champions again. Two times in the last three years now Real Madrid has tasted glory in Europe and for Zidane to do so in his first season? Astonishing. Cristiano Ronaldo next game with Portugal is a friendly international on May 29 of 2016, against Norway. You can watch Juventus live stream, Portugal vs Norway, Spain vs Bosnia, Italy vs Scotland, Brazil vs Panama, and Germany vs Slovakia, all matches provided from our sports streaming game pages.